Socialite Zari Hassan is a bossy lady but all the cars she flaunts on social media might not necessarily be her’s. 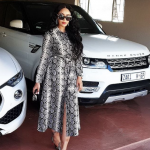 Though Zari Hassan is well off, fans think she has been flaunting too much on social media and that some of the items she shows are not her own. Replying to this, the mother of five stated that some of the cars are not hers but neither are they hired. They actually belong to her rich boyfriend who goes by the name King Bae ”My man has a collection of these beasts. I do not need to hire. If they do want to hire, they can google places they can hire,” she responded. One year The Ugandan socialite and businesswoman has been posting now and then about her new man ever since she introduced him on Valentines day. It’s been almost an year off being single for Zari since she broke up with Diamond Platnumz in 2018. Zari also told fans the reason why she’s hiding Kingbae’s face is because he’s only her’s and not for social media. The post Zari denies hiring cars to floss on social media: My man has all those cars appeared first on Ghafla! Kenya.